The Sepsis Coordinator Network (SCN) is a community created by Sepsis Alliance to provide sepsis best practice resources and guidance to sepsis coordinators and all health professionals across the country. The SCN is led by a team of expert leaders in the field of nursing with critical experience in caring for sepsis patients, and developing and implementing sepsis protocols. The SCN’s Advisory Committee guides the content and structure of the group using a collaborative approach and using evidence-based practice to provide guidance to those seeking help. The advisors represent a diverse group of hospital types and sizes, professional backgrounds and geographic locations. Learn more about the individuals that make up the SCN Advisory Committee. Want to learn more about how the Sepsis Coordinator Network can help improve outcomes in your facility? 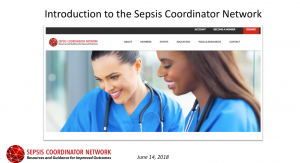 Check out the webinar, Introduction to the Sepsis Coordinator Network, to learn the history of the SCN, and get a tutorial on how to use the tools and resources.